Ordained by the United Church of Canada in 1976, he had a full-time clergy career in parish ministry, hospital chaplaincy, and campus ministry (including as Carleton University Chaplain, 1999-2009). As a part-time university teacher since 1982, he has taught courses in anthropology, sociology, and religion at Carleton and Saint Paul University from First Year to M.A. levels. In June 2009, he was appointed the McGeachy Senior Scholar in the United Church of Canada, and commissioned to undertake a national study of the religiosity, spirituality and values of Canadians born in the 1980s, published as Listening to The Echo – young adults talk about religion, spirituality, God, gods and their world (FriesenPress, 2016). His research has also been published in several articles and book chapters, and presented in documentary theatre projects: The god Monologues (2013), godVERBATIM in the 2014 Ottawa Fringe Festival, O god in the 2015 Fringe, and Trans-Script in 2016-17. 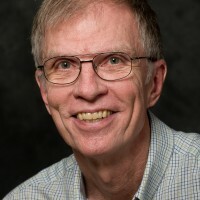 He continues to teach and supervise graduate students at Carleton. In 2017-18, he is the Dean of the Ottawa School of Theology and Spirituality. Tom Sherwood was Religion and Life columnist for the Ottawa Citizen in the 1980s and ’90s, and a freelance writer of popular articles for many years. His academic publications since 2000 include articles on Multiple Religious Practice, Religious Diversity in Canada, New Understandings of Ecumenism, and University Chaplaincy.